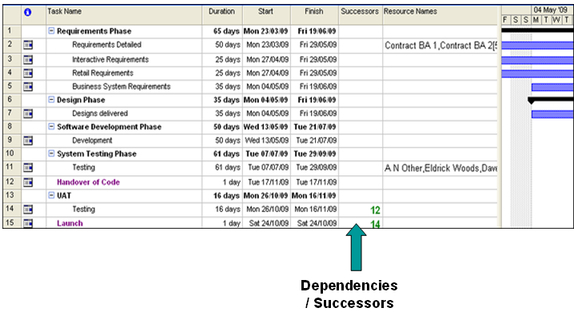 Dependencies or Successors are a key element when writing a Project Plan. They basically inform what tasks need to be done before another one can start. As such they are vital in determining the order tasks need to be done. Usually when a plan is written, it is done so in date order by workstream. The problem with this is that often certain tasks need to be completed by one workstream before another workstream can start their task. An example of this is a development team needing to complete a code build before testing on it can start by the test team. Documenting these in a project plan is relatively easy. 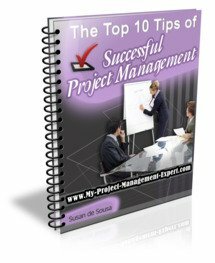 Using Microsoft Project you simply need to look at the task which must be completed before another can start and then put the line number of that task in the Successors or Dependencies column. This is demonstrated below in the example shown. Once you have done this, the software should automatically align up dates which should quickly demonstrate whether your plan is feasible. Further it will also highlight the "must have" things which are required. So for example the Creative Design Team say they need the Marketing Brief from the business before the website designs can be completed and signed off. This then means you have to chase up the relevant Marketing Leads to ensure they prioritise this work to meet the timeframes. It is important to give teams this kind of notice because they may not have been aware of the urgency in getting their deliverables done, and also not realise the impact on other teams if their delivery is delayed. You would be surprised at how much in silos Teams work. Now besides there being dependencies between tasks in the project there are also dependencies between Projects. In fact it is extremely unusual for projects to operate in complete isolation They usually always have some kind of dependency on a deliverable from another projects. Now this could be anything from getting resources and environments from one project to needing another project to complete their development so that your project can start developing on the codebase. These kind of inter project dependencies can be detailed in a plan in a separate section, but also should be documented in your weekly Project Management Report. This way if any inter project dependencies slip, it is easy to highlight these and ensure they are escalated upwards for resolution. You may well be able to make an educated guess what the Dependencies are but always double check these with your workstream leads before baselining your plan just in case you've missed something.